The following guide will explain to you how to flash or install a new firmware on Samsung Galaxy J1 Mini Prime. Most of the Android phone user use this guide to fix any problem occurred on their device. For example, you can use this guide to fix a bricked or bootloop device. If your device is boot-looped, it will only show the Android logo during device boot-up and will reboot again. This will be repeated continuously and make your phone can't be used. By installing the new firmware or stock ROM, your phone will return to the factory setting. And, will normally boot up to the home screen. To flash a new firmware to the Samsung device, we need a special tool developed for Samsung phone. This tool called ODIN. Before the flashing process starts, below you can see the Samsung Galaxy J1 Mini Prime specifications. Make sure to keep the battery at fully charged, This will prevent the system goes down during the flashing process. Please note, the flashing process will delete everything stored in the phone internal memory. We highly recommend to backup everything if possible. But, if forced to flashing your device without backup it. You must be willing all files will be deleted. For better connections, we recommend using the original USB cable to connect your phone to the computer. This section is the important step, you must have the compatible firmware as your Samsung Galaxy J1 Mini Prime versions. The firmware is available to download from samMobile. This firmware is free, but you must be a registered user to use all feature at the samMobile website. The following link is the firmware for Samsung Galaxy J1 Mini Prime. Samsung Galaxy J1 Mini Prime (SM-J106B). Make sure your computer installed a compatible USB driver with your Android Samsung phone. Then, you must have a Firmware or Stock ROM for your Samsung Galaxy phone version. You can download the Samsung firmware at SamMobile.com. Now, get the latest ODIN software. The latest version when this guide made is V.3.12.7. Put ODIN software and Samsung firmware at the same folder. Then extract or unzip all file. 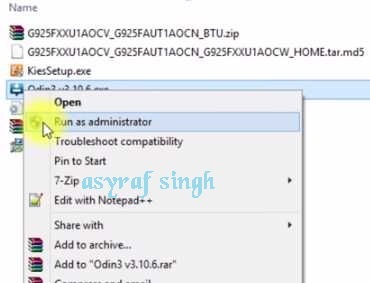 Now, open ODIN folder and right click on ODIN V3.12.7.exe --> select Run as Administrator. Once ODIN windows come up on your computer screen, you can go to your Samsung phone. Then do the following step. Power off your Samsung phone. Bring your Samsung phone into download mode. Once your Samsung phone on download mode, connect it with USB cable to the computer. Now, back to ODIN windows. ODIN windows should show the following image when your Samsung phone connected. Under Log tab: it will show that phone added. Under ID:COM: it will show com number, for example, COM4. Now, click AP or PDA button. It will browse the Samsung firmware, you can navigate to the folder where you put it. Only firmware files with *.tar, *.tar.md5, *.smd extensions are accepted. You may only see AP or PDA button depends on the version of ODIN software that you used. Under option tab, Select the following options to check. Now click Start button to proceed write firmware file to Samsung phone. ODIN already write a flash file to your phone, you can see this task at the progress bar. The flashing process will take approximately 5 until 10 minute without your interventions. Disconnect the phone from the computer. Once the flashing process is done and you didn't see any error, you will see notification PASS!, with green background. For the other ODIN version it show Reset. Now your Samsung phone will reboot automatically. If there are not something wrong, your phone will normally boot up . Once your phone ready to use, you can check the firmware versions. 0 on: "How To Flash Firmware or Stock ROM Samsung Galaxy J1 Mini Prime"